Healthcare – Chickasaw Telecom, Inc.
Fast, factual communication has always been a vital component in a health care setting. The patient must be able to communicate his needs to the staff; and the staff must be able to communicate with each other and with their patients. Chickasaw has the ability to fulfill any healthcare facility’s communications requirements no matter how simple or complex the operation may be. Using time tested equipment from West-Call, Chickasaw Telecom can customize each system to meet a specific need. Drawing from our more than 100 years of experience, we can design, implement and manage a healthcare communication system tailor-made for your specific needs. Novus® is Latin for “extraordinary,” and our nurse call system is exactly that. It features a new computer designed by West-Com, Cat-5 cabling, a new i-Dome® for instant status of at-risk patients, newly-designed patient and staff stations, new bathroom push/pull assist station (since not every bathroom call is an emergency), and new web-browser capability that will give medical facilities the ability to do more than they’ve ever done before, faster, easier and more securely from many locations. Novus® will grow with your facility’s needs. It is backwards compatible. If you have an older West-Call product, it can be adapted to a Novus® System. Simplicity of operation and intuitive functionality have earned our WestCall system the distinction of being independently rated the easiest to learn, install, and use. Our system is designed to help staff manage even the most complex operations in the simplest and most efficient manner possible. 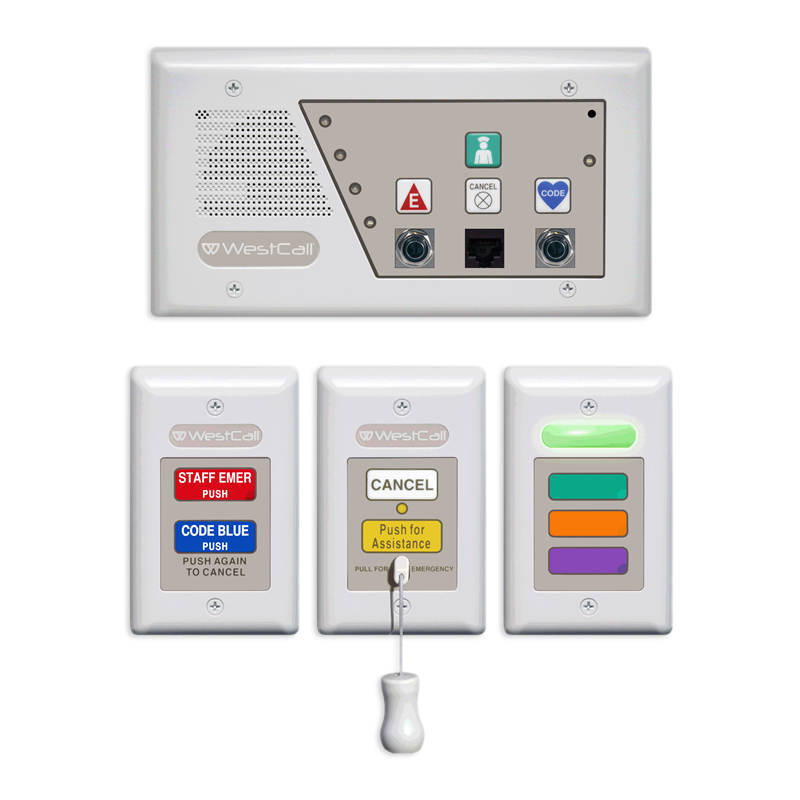 Intuitive operation is critical for any medical communication system, and WestCall allows rapid, sensible mastery of the pertinent buttons and switches involved. 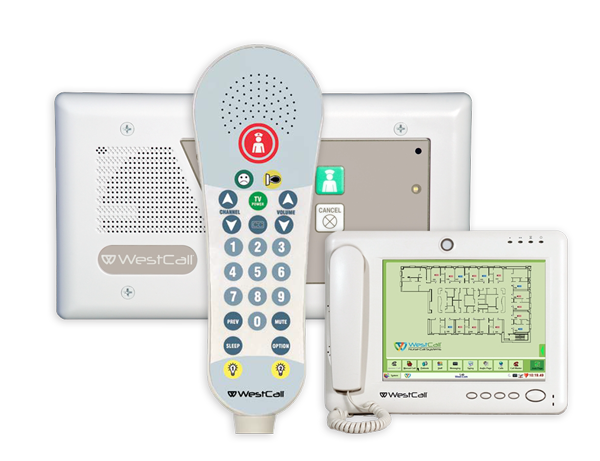 By integrating vocal commands, color coding, and customizable functionalities, WestCall systems make it exceedingly simple for both patients and staff to communicate effectively under any circumstances, from the most routine calls to life-or-death situations where rapid response is critical. When using a WestCall system, a facility will improve in both patient and staff satisfaction. West-Com is proud to be home of the number one-rated nurse call system, which is also the only nurse call system in the industry that is fully backwards compatible. We stand by our promise to never leave a product behind and provide an upgrade path for every component of our system. Our guarantee ensures that engineering and training hours spent at the start of a project are never wasted, and no matter how many new features and updates our system and software developers create, the new version will always offer an upgrade path from the earlier version. A West-Com investment today is also an investment for the future. Because our systems and products are all backwards compatible, healthcare facilities can feel confident in their initial investments with West-Com and easily plan for future expansions to their facilities and updates to their systems.